"KALUTALIKSUAK are an obscure psyche-avant-rock that bear the name of a malicious ice-deity in Esquimaux mythology. The band was launched in 1993 in Moscow by Vladimir Konovkin and Alexander Chuvakov with other musicians varying from gig to gig, and dissolved in 1997 leaving no recordings except of poor quality bootlegs from spot-rehearsals… Konovkin spent the next decade studying the classic tube-organ at the Moscow Conservatory of Music, and working as a session-keyboardist (in 2001 he performed with Rick Wakeman at the concert in Saint-Petersburg). Chuvakov graduated the Russian Academy Of Fine Arts, and earned a living as a professional painter and book illustrator… Their joint musical researches were resumed only in 2006. 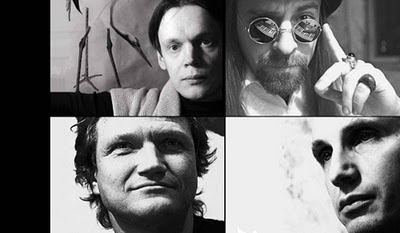 KALUTALIKSUAK's current line-up features: Vladimir Konovkin (assorted keyboards) and Alexander Chuvakov (guitars, flutes, voice), reinforced by Alexei Ohontsev from X-RAYS (bass) and Sergei Titovetz, a founding member of the soviet-period art-rock legend NUANCE (drums, percussions)." 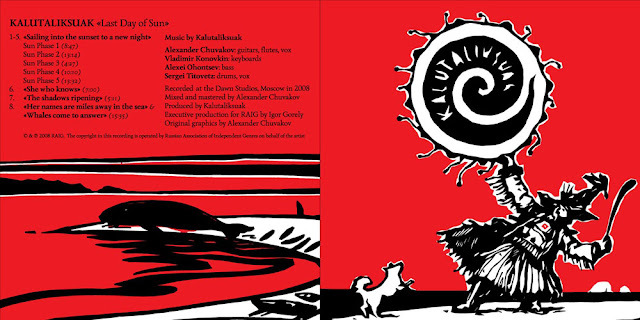 Psychedelic and spacey, eerie and quirky – such is the atmosphere in a land without sun; such is the mood prevalent in Kalutaliksuak’s album, Last Day Of Sun, depicting this very phenomenon of two day-less months in northern (or southern) regions of the globe. At times sounding like a long jam played over a pre-conceived theme, the long title track, divided into five parts, is an engulfing sonic voyage through weird and ominous soundscapes. It is not, however, developed into too high a plane as I would have liked it. Once it reaches its top levels it seems to linger there, though it does go wild, as the guitar and bass seem to be all over the place with their seemingly-aimless playing and the keyboards providing a “sheet” of smooth sound, serving as the quiet support for the rest of the instruments. But it feels more like a jam/improvisation session than a fully explorative and fully developed composition. Not that I dislike it, but then I would be more excited about it. As such it does provide a nice “freak-out” psych aural adventure which is best suited for late night listening and in the proper “wanting to get away” mood. The peaks the music gets to during the five parts are well done and would go well in any krautrock/space/psych-theme listening night. The sporadic use of vocals and flute serves to reinforce the mystical element of the music and the peculiar and even creepy nature of this piece, befitting the name of the band and its meaning (“a malicious ice-deity in Esquimaux mythology”). This title track, altogether clocking at around 50 minutes delivers very well the feeling of being stranded without a sun for a couple of months; the constant dark, the feeling of being “abandoned” in the cold northern winter; the yearning for the light to come back to the world. It is a powerful experience, fierce and trippy. The other 3 tracks on the album are not any different than what came before. Continuing the spacey and psychedelic journey, surrounded by a wall of sounds, they provide the same rather slow and grim style of before. Not only is the rhythm mostly slow or moderate, but the development of the music is done leisurely as well most of the time. The second track “She Who Knows” is a good example of this. If you’re up for a freak-out session, if you’re tired and need a good portion of psych-rock to gain back your strengths or if you’re just the kind of person who likes the sorts of vibes the music I described above gives you, then you should check it out. As for me, I like it quite a lot, but I wish that in their future release they’ll opt for a more focused and less jam-y style. This blog is the outlet for all my musical passions, new music that I discover, old favourites and everything in between. The blog will contain music reviews, music recommendations, interviews, featured bands, albums and even focus on styles/genres, as well as occasional news about bands and musicians. There is no predominant musical style covered here. It will run the gamut from rock and metal to jazz, folk, neo-classical and electronic; from ambient to experimental to psychedelic to progressive and avant-garde. Please, feel free to comment on the posts, saying what you think of the music discussed (or telling me how bad my writing is).